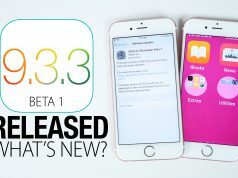 Today, Apple seeds iOS 9.3.2 beta 3 to developers, compared with the previous two beta, iOS 9.3.2 Beta 3 does not add anything substantive features, which still focus on enhancing stability and system compatibility. 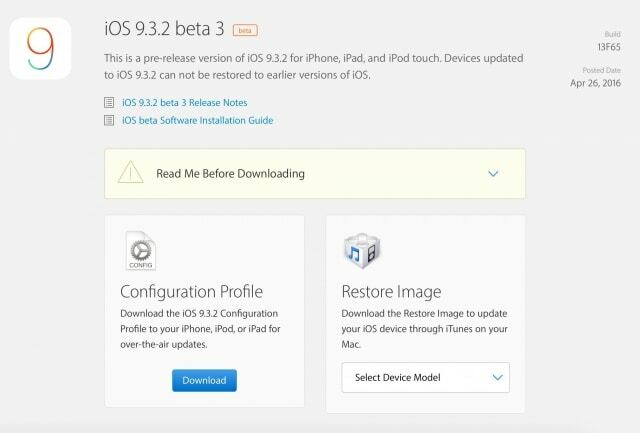 Earlier this month, Apple released iOS 9.3.1 official version, but recently the company has stopped signing iOS 9.3 on some devices, means that the user can only upgrade their device to iOS 9.3.1.
iOS 9.3.2 Beta 3 (Build 13F65) currently only available to registered developers. 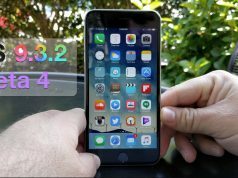 Although the release notes for iOS 9.3.2 beta 3 are scant on details regarding new features, but which inevitably contains bug fixes, performance improvements, and the ability to use Low Power Mode and Night Shift at the same time. Apple appears to have resolved some big issues with Game Center as part of the update, but other than that it looks like it’s mostly full of small tweaks. Developers can directly download this new beta over-the-air through the usual update mechanisms. If you installed an earlier pre-release beta, just launching the native Settings.app and tapping through to General > Software Update section. Beta 3 OTA of iOS 9.3.2 should then immediately show up as an available update which can then be download and installed right away. Alternatively, you can download iOS 9.3.2 beta 3 IPSW file from developer.apple.com and restore your device to it using iTunes.